When I first started to elaborate my bread section, I also intended, in parallel, to work on recipes which go really well with the bread varieties I have made. Confession time: I am falling very far being in creating blog posts which include all the toppings I have made to date. In earlier posts, I may have mentioned that I have been experimenting with a number of patés and toppings – be it hummus, smoked mackerel paté, black olive paté – the list goes on. These will all one day make it on Love the kitchen- patience is a virtue (apparently). The first I am going to write up is chickpea hummus, a positively middle-eastern dip, which, according to Wikipedia, (don’t worry, my life’s education does not originate from this website!) means chickpeas, in Arabic. It also goes by a number of spelling variations, notably: hummous, hommos, humos, hommus and hoummos. As far as recipes go, this is historic- with earlier incarnations going back to the 13th Century. This recipe is not my own, but so good, I wanted to share. I found it on the Inspired Taste blog, and kudos goes to the author for sharing it online. Personally (and yes I am biased), I think it tastes far better than anything store bought and takes just a few minutes to prepare. I have made chickpea hummus with a range of kitchen appliances, and find that the chopping bowl which comes with a stick blender is as good as any (and one of the easiest to wash up). You do not need the coolest and most expensive gadgets for this to work really well. Whilst it is commendable to cook your chickpeas from scratch, I would recommend buying them tinned and skinned if possible. The final outcome will be a lot smoother. The only ingredient which was a mission to find locally was Tahini – amazon came to the rescue. 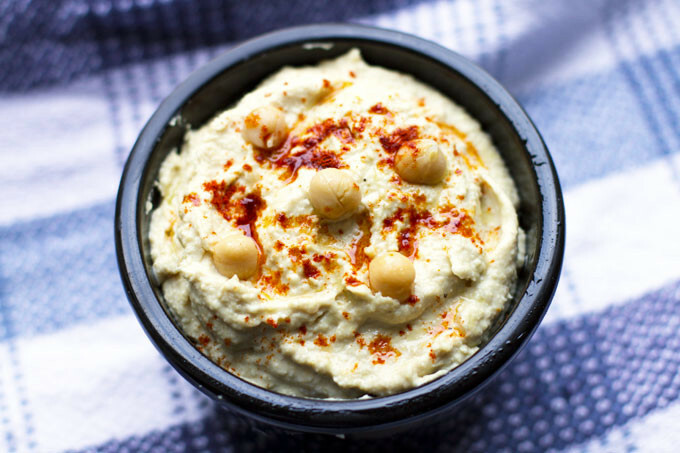 If this does not convince you enough to make it, why not read more about the 15 Heath Benefits of Hummus according to science? 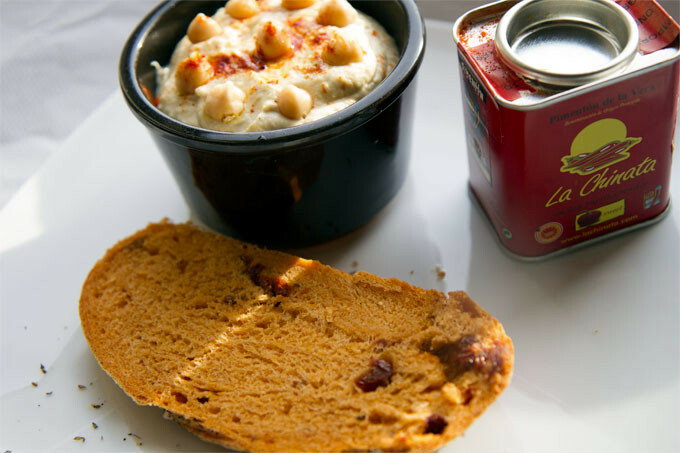 This chickpea hummus goes very well with sun-dried tomato bread. In a food processor, combine the tahini and lemon juice and and blitz for a minute. Next, add the grated garlic and olive oil and blend again until it forms a paste. Then, add the drained chickpeas (I always save a few for decorative purposes), salt and ground cumin and blitz again until smooth. If the texture is too coarse, add water, or some additional lemon juice until the desired consistency has been reached. Finally, turn out into a small bowl or large ramekin, and decorate with whole chickpeas you reserved earlier. Mist a little olive oil over the hummus, and sprinkle ground paprika over the top. If you fine the taste of raw garlic too overpowering, it is very easy to blanch the grated garlic in boiling water for a few minutes, drain, and add as normal. i think that one or two cloves of garlic is more than enough. sometimes I soak grated garlic in boiling water for 1-2 mins then strain to remove some of the sharpness..